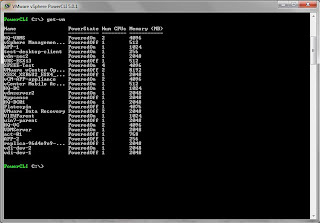 So if you're not using it already powershell can be a very powerful and useful utility. Powershell can save you many hours of digging through lists and trying to export data out of graphical interfaces. It can also be used to make configuration changes to a large group of objects you can't normally select all together. I'm going to give a few basic examples of useful powershell commands. First we'll cover what tools you should get in order to properly use powershell and make it as easy as possible to write and run your own scripts. The very first thing you need to do is download the latest version of VMware PowerCLI, which can be found at the VMware site in the downloads section. Third thing is optional but something that I personally do. Get a script editor that has some integration with PowerCLI powershell snapin's. The one I use is open source and called PowerGUI. This will allow you to "tab complete" some commands etc. Windows PowerShell is Microsoft's task automation framework, consisting of a command-line shell and associated scripting languagebuilt on top of, and integrated with the .NET Framework. PowerShell provides full access to COM and WMI, enabling administrators to perform administrative tasks on both local and remote Windows systems. In PowerShell, administrative tasks are generally performed by cmdlets (pronounced command-lets), specialized .NET classesimplementing a particular operation. Sets of cmdlets may be combined together in scripts, executables (which are standalone applications), or by instantiating regular .NET classes (or WMI/COM Objects). 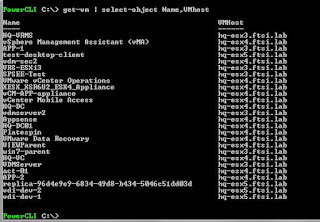 These work by accessing data in different data stores, like the filesystem or registry, which are made available to the PowerShell runtime via Windows PowerShell providers. Basically you can use this object orient platform to make calls from all sorts of different things and use them to perform all kinds of different tasks. As far as vSphere is concerned this can be very useful for SRM command integration or simple tasks such as figuring out what VM's have a snapshot and how old is it. For purposes of this post we're going to look at some basic commands and cmdlets. I'll also give a few simple examples. The set-execution policy command will allow us to run scripts that aren't "trusted" if we create them on our own. See Microsoft for more detail. We can also use these same commands in our powergui as well. If we open powergui you'll see three panes one for the script you are constructing, one for the commands that are run and to run/test commands in, and the other has some syntax info in it. You can see a full list of VM's and this is what's refered to as the default view, meaning these are the default things that are displayed to you. Name, Powerstate,NumCPU, and Memory. Let's say we wanted to see something different about the VM's. 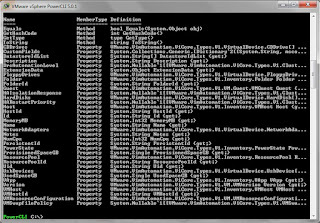 You can use the command "get-vm | get-member" the "get-vm" part gives the list of the VM's and the "|" passes that list to the "get-member" command. 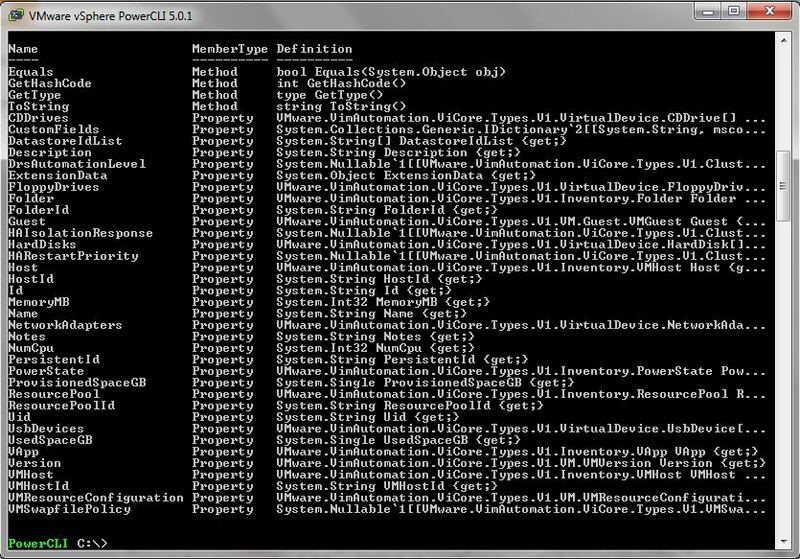 This will prompt powershell to give you a list of all the valid Methods and Properties on the "get-vm" objects. Lets say I wanted to share this list with some co-workers. Powershell offers the ability to export this output to something easy to work with such as a CSV file saving it in the reports folder on my C drive, this can be accomplished by issuing the following command. get-vm | select-object Name,VMHost | export-csv "C:\reports\vm-host.csv"
If you look in C:\reports\vm-host.csv you'll see two columns and one will have names the other will have hosts in it. 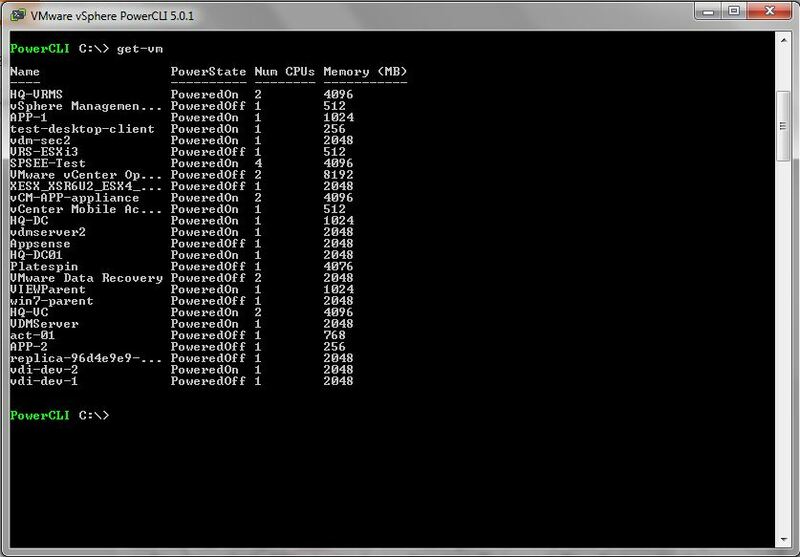 Now lets take a look at our list of VM's and figure out how much memory is allocated to all of the VM's we have built. We can use a cmdlet called "measure-object" which will allow us to do all sorts of statistical calculations on the numbers that are returned. We can "-count" the number of objects, "-sum" the objects, "-average" the objects, or find the "-min"/"-max" values. this default view shows how many objects there were and what the sum was.